GREENBURGH, N.Y. -- New York Rangers forward Mats Zuccarello sustained a brain contusion and a hairline fracture of his skull in Game 5 of the Eastern Conference First Round against the Pittsburgh Penguins that sidelined him for the remainder of the Stanley Cup Playoffs, he said Monday. Zuccarello, who was hit in the head by a Ryan McDonagh slap shot on April 24, said he even lost feeling in his arm and was unable to talk for four days. He is expected to make a full recovery. "I was in the hospital for three days," Zuccarello said Monday at Rangers breakup day. "I couldn't talk for a while. Just had a contusion, some blood in my brain. That affects a lot. Now I go to speech therapy. I'm getting much better. I couldn't say a word for four days. I feel much better. "I had a small fracture in my head. I lost my talking and some feeling in my arm and stuff." The Rangers listed Zuccarello with an upper-body injury. He attended several games in the press box and began skating in a non-contact jersey last week. Zuccarello said he probably wouldn't have played had the Rangers advanced to the Stanley Cup Final. They lost 2-0 in Game 7 of the Eastern Conference Final by the Tampa Bay Lightning on Friday. "There was a small chance I might play more this year, probably not," he said. "Obviously I wish I could play in the Finals, but all you have to think about is the next season. "There's no reason to speculate that now. … I couldn't talk. I lost everything. It was scary, but the doctors were really good and made sure I knew that I was going to be healthy. After a while I was just happy to recover quickly." McDonagh said it was difficult visiting Zuccarello in the hospital. "After the game, went to our trainer and asked where he was and they said he was in the hospital," he said. "I went with the doctor to see him and it was not a very good sight. You don’t want to see your teammate in a hospital bed and wires going every which way making sure that he is OK. We wanted to try and communicate with him, but it was a challenge for him. Tough to see a very close friend and a big part of the team go down that way." Defenseman Keith Yandle said the severity of the injury was frightening. "You kind of put hockey aside for a second when you talk about someone getting hurt the way he did," Yandle said. "You think of a guy not being able to talk to long-term damage. Hopefully it isn't that, and it seems like he is getting better and better every day." Forward Derick Brassard said Zuccarello was a big part of the offense and was missed in the playoffs. "I saw him the day after the incident happened, in the hospital," Brassard said. "It wasn't easy, but at the same time I think he was being taken care of by our doctors and they did a really good job with him. We just need him to take this summer and make sure he is 100 percent for next season. … He's a big part of this team. I think we really missed him." Zuccarello had 15 goals and 49 points in 78 regular-season games. He had two assists in five playoff games and is looking forward to next season. A pending unrestricted free agent, Zuccarello agreed to a four-year, $18 million contract with the Rangers on March 2. "I'm going to rest a little bit longer and recover and come in, and I should be ready to go," he said. 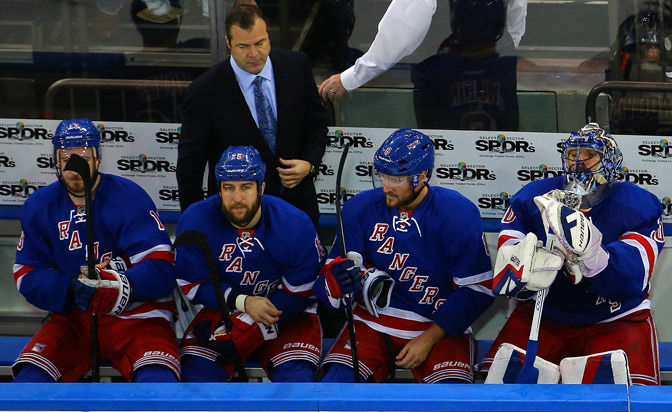 New York dealt with other injuries during the postseason that affected its defensemen. Marc Staal played with a hairline fracture in his ankle sustained in the regular season. McDonagh played through a broken right foot sustained in Game 4 of the conference final, and Dan Girardi sustained a Grade 1 MCL sprain, also in Game 4. Yandle sustained a sprained shoulder against Pittsburgh in the first round. Staal said his foot swelled up the more he played on it, and the doctors were freezing it. He may have surgery if the injury doesn't heal. "Wait a couple of weeks. If it's not better, there's a little chip of the bone on the outside that they might have to take out," he said. "Other than that, we will probably take three weeks and see where it is at." McDonagh, who had crutches and a walking boot on his foot Monday, said he should be healed in four weeks. "It was tough. I really had to simplify [my game]," he said. "Obviously couldn't be as aggressive offensively as I wanted to be. … Tried my best and the guys were very supportive in helping me out."